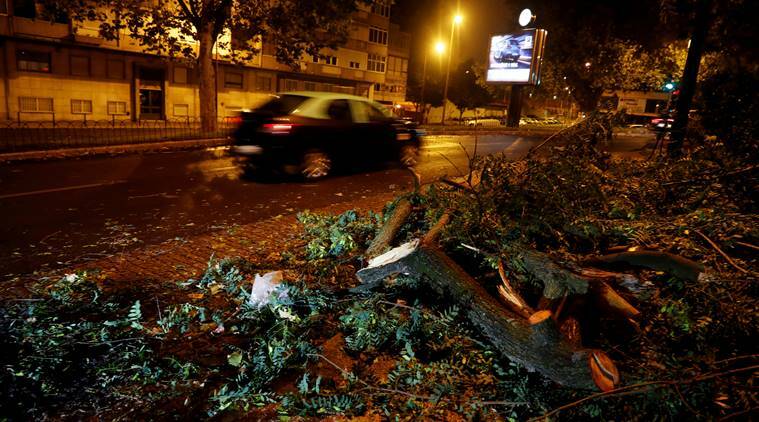 Lisbon: A weakened hurricane Leslie slammed into the coast of Portugal, leaving 27 people injured as it uprooted trees, brought down power lines and smashed store windows with gusting winds and heavy rain. Over 60 people were forced to leave their homes by the storm and over 300,000 people suffered power outages overnight, Luis Belo Costa of Portugal’s National Protection Agency said. Leslie had been downgraded from a Category 1 hurricane to a post-tropical cyclone with winds of 110 kph by the time it landed on Portugal’s Atlantic coast late Saturday. But state broadcaster RTP said Leslie’s wind speeds reached 170 kph in the coastal town of Figueira da Foz, 200 kilometers north of Lisbon.